Well N214SW made it out of the paint shop at Glo Custom and Doug took some pics and put it on the front page. I'm going to pick it up tomorrow. 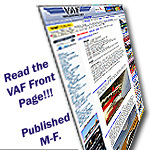 Check out the pics on the front page of VAF. Last edited by DeltaRomeo : 08-19-2016 at 12:07 PM. Fantastic looking plane you should be very proud. I like your interior colour , what colour is it? The finish of the interior looks good with those seats and the finishing touches you have made..
What are the plastic boxes on the side walls down near the seats to excuse my ignorance? Great job and motivation for those of us still building. I have to check the color of the interior. The plastic boxes are drink holders and work great. Weather keeping us from picking her up right now. Very nicely done Stoney. Just got a new screensaver for the hangar laptop!! Beautiful. I'll bet those checkers added at least 5kts! Fantastic airplane. Fantastic accomplishment. I really like the color combo. Thank you. Scheme Designers did the design and Glo Custom did the paint. I had Walt at Exp Aircraft Services on the field at 52F do the prop balance and IFR cert while it was there and WOW, what a difference. The engine is so much smoother. Now it's time to just enjoy, travel and tinker. Somehow I became involved doing the inspections on this project. My friend Larry Beamish did the maiden flight and I have done some of the other test flights. Below is the RV in front of my house/hangar. Below is a picture of the panel. Dual Skyview. Right now it has 19 hours on the Hobbs and I am planning to complete the test phase within the next two weeks. Note that we only have to do 25 hrs over here. Looks nice, is that the stock Vans canopy? In the picture it looks darker than what I've seen on other -14s.